New York: Sarnath Banerjee has delved into several disciplines in his career. Although he started with an academic career in the natural sciences and biochemistry, he has now dedicated his work to the arts, specifically creating graphic novels that illustrate a variety of cultural topics. Banerjee combines words and fanciful visuals in his work to portray storytelling and artistic expression. His works cover various cultural topics and controversies such as politics, sports, literature and art. Banerjee is no stranger to the Indian political environment that he often discusses in his work. Prior to this year, Banerjee and his wife, Pakistani artist Bani Abidi were living in New Delhi. The political ramifications between India and Pakistan directly interfered with her artistic career, specifically travel restrictions. This, along with a fellowship for Abidi, motivated their move to Berlin, Germany, the scene of his most recent work, “Enchanted Geography”. “Enchanted Geography” was directly inspired by Banerjee’s experience acclimating to this new cultural environment. The work documents the mundane and casual elements of this environment just as carefully as the exciting and colorful aspects. In doing this Banerjee hopes to push aside the inventive stereotypes that Berlin is known for. In “Enchanted Geography” he has revived a protagonist from his past works, Brighu. By utilizing this character as the vessel for exploring Berlin, Banerjee saw the city through completely new eyes. It was ripe with imaginative narrative for him to discover and explore. Many of the artist’s true experiences in Berlin are directly integrated into the story. Encounters that Banerjee had with real individuals in Berlin, including a Jewish German composer. The artist comments on his usage of equal parts imagination and life experiences: “In my works fact and fiction collide in strange ways. That can only happen in your head”. Overall this examination of real life occurrences shows through in his strong development of unusual, yet life-like characters. 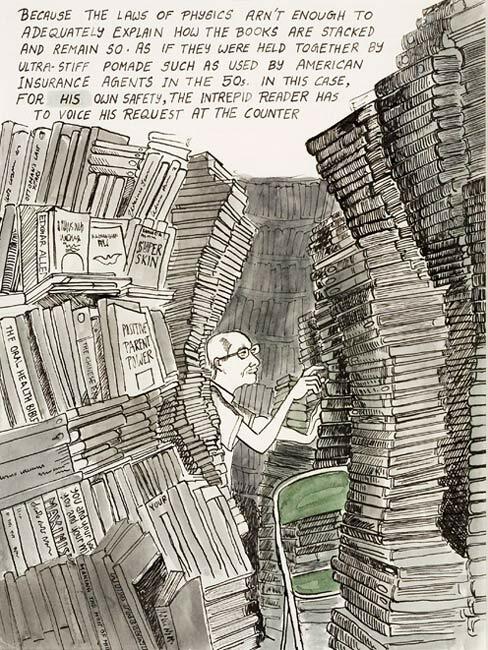 His past project “Tyranny of Cataloguing” documented the trials and tribulations of an author stuck in a maze of books searching for his own work and later dying in the endless stacks of books. His most recent exhibition in London, “Gallery of Losers” examines the often overlooked mediocre, anti-hero archetype. Through his illustrations and words alike, Banerjee has the ability to transport the viewer into an undisclosed, but not unimaginable world. He balances the normal and realistic, without losing site of the artistic and engaging element of the work. Sarnath Banerjee’s “Enchanted Geography” will unfold over six months every Sunday in The Hindu, one of India’s largest newspaper publications. To learn more about his project click here.